The SOA Certified Professional (SOACP) curriculum from Arcitura is comprised of 23 course modules. Course delivery options can include private on-site workshops, live virtual training, public workshops or self-paced training via Study Kits or eLearning. Each module is a one-day course when taught by a Certified Trainer or can take 10-14 hours to complete via self-study. An easy to understand, end-to-end overview of contemporary service concepts and technologies pertaining to modern-day microservices and service-oriented computing, as well as business and technology-related topics pertaining to service-oriented architecture (SOA). A course that focuses on modern service technologies, models and concepts that have established de facto implementation mediums for building contemporary services-based solutions. Also covered are fundamental terms, concepts and models pertaining to cloud computing and cloud-based services. Essential topics pertaining to service architectural models and practices and principles relevant to service and microservice design. Service-oriented architecture, service-orientation, and microservice architecture and composition are explored, along with a range of distinct considerations for designing service-oriented solutions with REST services and Web services. Provides comprehensive coverage of SOA analysis techniques and approaches, including strategies and concepts for service modeling, composition modeling and microservice modeling. Topics include service models and service layer abstraction, entity, utility and micro task abstraction, as well as specialized service API modeling techniques. 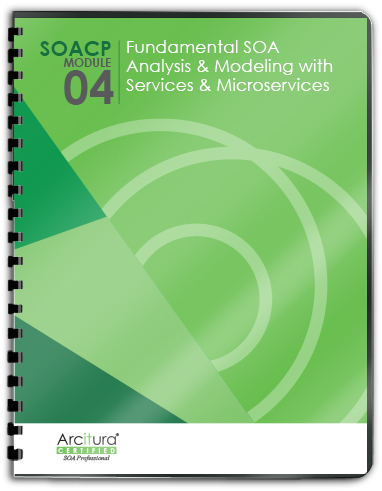 Delves into the step-by-step processes for the analysis and modeling of services and microservices for REST service and Web service environments. The course covers a range of topics with an emphasis on business service context, service models, microservices, functional scope definition, balanced granularity and establishing effective service layers as part of an overall conceptual blueprint. A lab during which participants apply the concepts, processes, techniques, patterns and principles covered in previous courses in order to a complete a set of analysis and modeling exercises. Specifically, participants are required to analyze case study backgrounds and carry out a series of exercises to solve a number of inter-related problems, with the ultimate goal of modeling services and service-oriented solution blueprints. Provides an in-depth exploration of the overarching models and underlying mechanics of service-oriented technology architecture. A wide range of topic areas is covered to provide techniques, insights and perspectives of the inner workings of service and composition architectures, including messaging, microservice deployments, service contracts, API gateways, containerization and many more. A lab during which participants apply the technologies, concepts, techniques, patterns and principles previously covered in order to complete a set of design exercises. Specifically, participants are required to study case study backgrounds and carry out a series of exercises to solve a number of inter-related problems by applying design patterns to design services and service-oriented solutions. Establishes foundational microservice architecture and design models and further introduces containerization concepts and container characteristics. Topics covered include microservice deployment, provisioning, registration and isolation levels, as well as logical containers, PODs and composition architecture. Provides a patterns-centric, in-depth exploration of the practices, models and technology architectures behind microservices and containerization. Topics include microservice scaling, data management and autonomous ownership and versioning, as well as event sourcing, CQRS, composite isolated containers and container hosting models. A lab during which participants apply the concepts, processes, techniques, patterns and principles previously covered in order to a complete a set of architectural and design exercises pertaining to microservices and the use of containerization. Essential topics are covered pertaining to modern-day service API design and management, including positive and negative API coupling types, API proxies, API gateways and API versioning. Advanced coverage of service API design and management patterns and practices, data serialization protocols and binary and non-binary communication protocols. A lab during which participants apply the concepts, processes, techniques, patterns and practices previously covered in order to a complete a set of design and management exercises pertaining to service APIs. Service project delivery methodologies are explained, including top-down and agile delivery. Governance technology and task types are established, along with service vitality triggers and processes. The basics of governing services, microservices and service-oriented solutions are then covered, including models and frameworks for addressing lifecycle management and individual service governance issues. A range of service governance precepts and processes is covered, including those that address service usage, monitoring, legal data audits, testing practices, as well as service analysis, design and programming. Also covered are SLA versioning and service policies and systems/continuous engineering and agile delivery. A lab during which participants are required to solve a number of service governance-related problems associated with establishing service lifecycle governance programs, measuring and identifying weaknesses in existing governance systems, and applying governance precepts and processes in response to business requirements. Provides essential techniques, patterns and industry technologies that pertain to establishing security controls and security architectures for services, microservices and service-oriented solutions. Covers a series of technical and complex security topics pertaining to contemporary microservice deployments, service-oriented solution design, infrastructure, API gateways and modern service technologies. A lab during which participants apply security patterns, practices, and technologies to counter threats and solve a set of complex security problems. Covers software quality management, assurance and testing topic areas, as they pertain to the overall quality assurance and lifecycle of services-based architectures, microservice implementations, on-premise and cloud-based shared services, service-oriented solutions and service ecosystems. Advanced topics address specialized testing practices for cloud-based services, microservices, complex service compositions, performance, load and stress testing, as well as the creation of comprehensive test plans for shared services and service compositions. A lab during which participants apply quality assurance practices first-hand via a series of exercises. Common problem areas are addressed with microservices, shared services and service-oriented solutions, and participants are required to apply techniques that guide services and solutions through processes designed to help them meet specific certification criteria for production-ready deployment.